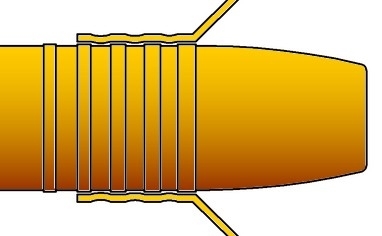 Crimping is normally not required with a drive band bullet because the brass springs back slightly between the drive bands when the bullet is seated. See the illustrations of a sized case and a case with the bullet seated. The ripples in the case are clearly visible. This acts as a multiple crimp but has great precision because the variables from cartridge to cartridge are held to a minimum. 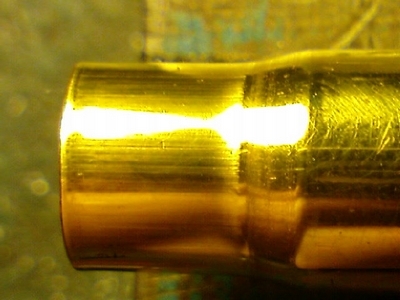 When a normal crimp is applied to a case, varying case lengths, however small, will cause the crimp to vary and bullet pull weight will vary also. In some cases, applying a crimp will actually loosen the brass slightly just ahead of the shoulder. Should you find that a drive band bullet moves under recoil, first check that the case neck is sized down as it should be, then check that the sizer button is not over size and, if both are within spec, only then should a crimp be applied. Make sure that the crimp falls between two drive bands. To determine if the die set is in spec, two experiments are required. First you must check the body of the sizer die and secondly the sizer die button. 1. Remove the button assembly from the sizer die. Size and load five cases that have previously been prepared, sized and primed in the normal way. Do not apply a crimp and measure the C.O.L. carefully. 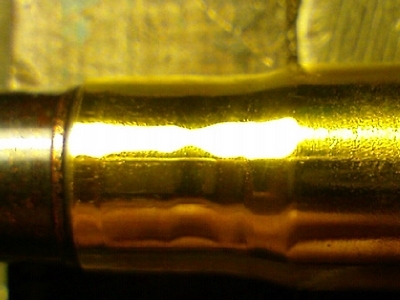 Load as many into the magazine of the rifle as it will accommodate. Fire all but the last one. Load the remainder of the ammunition on top of the one remaining in the magazine and fire them. Measure the COL of the remaining unfired round. If it has changed, the body of the sizer die is over size in the neck area or the case necks have been trimmed too thin or you have a monster recoiling rifle that needs a crimp. This is unlikely. If the COL has not changed, you obviously do not need to crimp. 2. If the first step shows no crimp is required, repeat the sequence but with the sizer button re-installed. If this firing sequence shows a difference in COL, the sizer button is over size. Spin the button down until the case holds the bullet effectively. The same experiment can be done with double rifles by loading both barrels, firing only one side and checking the unfired round in the other barrel.